I’ve also been very inspired by camera+. It’s a fab little app for iPhones which turns you into an instant pro. 1) pinnacle @ duxton is a really nice place for photography. It doesn’t matter how lousy a camera you have, or how bad your skills are, it’s almost impossible to make it look bad. 2) having few material objects makes you feel very free. Material things burden me… They take up space… And memories. So I shall strive to have fewer material objects, and throw away what I can. 3) moving out on your own, is slowly gaining popularity among the generation y’s. Why wait til you get married? There’s no price too much to pay for freedom! We are backs froms our “break the silence” trip to KL! Oh ya, we’re holding a Polaroid give-away on our Facebook page here’s what you get if your comment is the most liked! Ok. So much for the “without further ado”… here we go! Cyn and I looking mega sleepy on the plane. Dawn’s out cold to my left, so I kindly didn’t include her unglam sleeping position in this picture. As I said, 5am is not a good time to wake up, in any circumstance. This is kimchi and huayan snoozing/fidgeting/attempting to sleep in the gosu van which we took from the airport. It can seat 8 people, excluding the driver! And it has APM seats. Haha. Dawn, Cyn and half of me. Once again, I have kindly only included half of out cold Dawn in the picture. She should treat me to a meal for this. Cyn’s giving her signature ahhh pose. First glimpse of our boutique hotel – we booked a family room and it was really quite pleasant, with a very helpful owner who sent us to the competition venue in her car. De’art hotel, by the way. The purple and silver chairs at the reception where we spent half the morning waiting for our room to be ready. Everyone is on their iPhone or hand held device. Three cheers for hotel wifi and technology! And here’s Lgd who took over our seats the minute we got up. That’s the famous Chuan in the seat nearest the camera. Took the opportunity to take pictures while waiting for our room to open. Dawn used this really cool iPhone app called pudding camera (it’s in korean) to take this shot of me against nice wallpaper on the second floor of the hotel. The room door opposite the wall was open, cos they were cleaning it out, so the daylight came in at a very flattering angle. Looks like a studio shot, no? We were fortunate enough to get to play our match in the air-conditioned LAN shop (or CC – cybercafe, as malaysians call it). That’s us setting up our equipment. As you can tell, we like to use Razer stuff! This is taken off gosugamers.net. We were at the registration table checking out brackets. Another impromptu shot at the registration table, also taken by gosugamers.net. Not as nice for me and cyn… Haha. But at least there’s the 5 of us in it. Cyn and i on our way back from the minimart, spotted by a Facebook fan who took a pic and tagged us. I’m carrying my favourite red tea by lipton. Very windy at the main stage front seats!! The main stage, as viewed from the front row of seats. Pic of the crowd watching the games. Another pic of the crowd at the outdoor stage area. Dawn, kimchi and huayan next to two empty seats that cyn and I were occupying. As you can see, they are very engrossed, and getting a great view up front. Or maybe not so engrossed. Huayan taking a cat nap. Apparently these trees are a major attraction, and crowds flock over to i-city just to stroll around these fake trees at night. They are actually just poles with LEDs on them! Here’s our dinner spot for Saturday night. Aeon and us settling down and waiting for the steamboat pots to arrive. NutZ, Eryc, whiteface, chawy, Xy, lux, waiter, huayan, cyn, Dawn. China’s best team appeared at the restaurant for dinner later too. CCM went on to win the 15,000RM first prize the next day. Cyn getting ready to feast. Huayan impaling a Yong tau Fu. We should turn this Yong tau Fu into our team mascot!! Lotus root and random other Yong tau Fu. Eryc has very bad engagement timing, always tries to eat the food that we just dumped into the pot. Aeon in their full glory. Lux making an appearance to the extreme right of the pic. Btw, congratulate him on Facebook! He just passed his driving test today! Whiteface, evidently feeling full, satisfied, and very sleepy. Bt the concept of fake trees being an attraction is quite a strange concept to me. I guess entertainment comes in all forms! After dinner chill out and strat-talk session, with my team listening in. We try to learn what we can! Cyn and i (and the rest of my team, less obviously) on video on the main stage screen!! 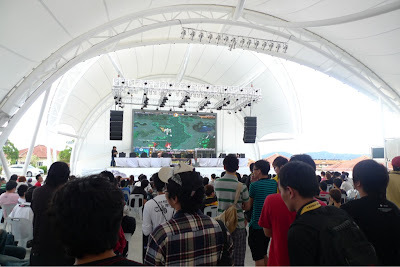 Thats a video made by Razer which had footage of Tokyo Game Show and BiG Festival in Bangkok, which we attended. Only in Malaysia do you get marshals who also act as sun screens for the participants. Here we have nirvana.my (don’t think they are called that anymore) Vs Scythe. Xtinct paused the game halfway to pay the toilet a very long visit. Kimchi, huayan and I waiting for the games to resume. 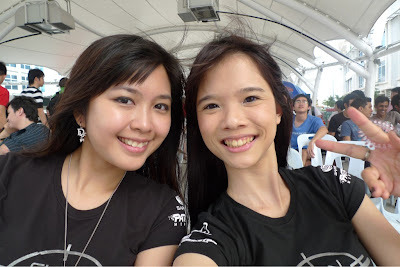 Huayan and I taking the opportunity to cam whore when the wind died down. Wind is still not blowing. Huayan throwing the oblivious kimchi a “hmmm! ?” glance. Kh aka melodyofmayhem and drakan dropping by to keep us company and watch the finals. Ok, I think they were there more to catch the finals than to keep us company. Me in the reflection of my iPad. You can see the dent I accidentally made in my screen protector before I pasted it on. /kicks self for being so retarded. iPad is great for team entertainment whilst waiting for stage matches to begin! Boggle ftw!! 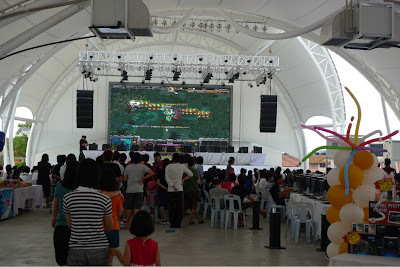 The amusing emcee doing a Razer stage show. Game in progress!! China’s flag on the left, and Scythe’s Singapore flag flying on the right. Interesting point to note : Scythe is made up of 3 Malaysians and 2 Singaporeans, but they chose to fly the SG flag. Sad that I had to leave halfway through the first game of the finals – finals were best of 3 games. It was 4-22 in favour of CCM when I took my leave. CCM proceeded to win Scythe 2-0. And so concluded the 2 day trip to PDC.